Today, AMD has released Radeon Software Crimson ReLive Edition 17.9.2, bringing 2-way multi-GPU (mGPU) support for RX Vega cards, as well as Project CARS 2 support ahead of tomorrow’s launch. 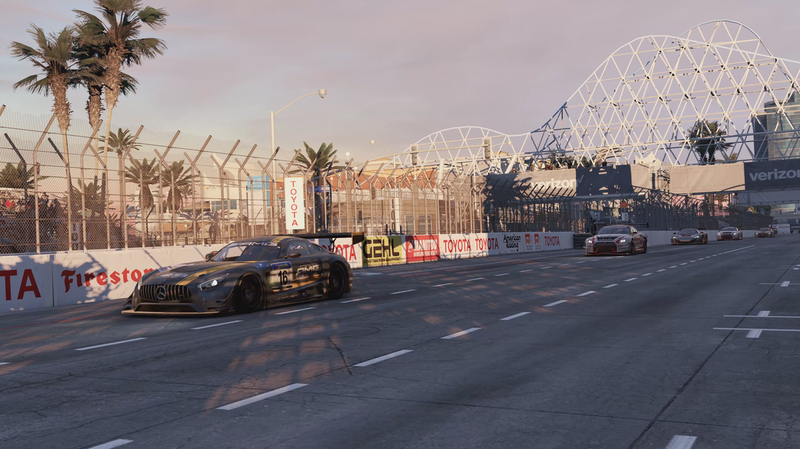 In addition, AMD has included mGPU profile support for Project CARS 2. Featuring Driver Version 17.30.1091 (Windows Driver Store Version 22.19.677.1), Radeon Software 17.9.2 also fixes two bugs: Hearts of Iron IV system hangs when the campaign scenario is launched, and erroneous “1603 error” messages after successfully installing Radeon Software. The release of a multi-GPU enabled Vega driver comes at an interesting inflection point for overall multi-GPU support in the industry. NVIDIA's own views are well-known, meanwhile more recently with the Vega launch, AMD has stated that they're also deprioritizing multi-GPU support for Vega and future architectures. The company still supports mGPU – as evidenced by today's driver release – but it's no longer a significant focus as it once was. The root cause of this dour outlook has been the same on both sides: game engines are increasingly using mGPU-unfriendly rendering technologies, which in turn has made adding mGPU support more difficult for game and driver developers all the while also limiting performance gains. This in turn has created a downward spiral in mGPU usage; as it's no longer a reliable means of getting more performance, the percentage of mGPU system setups has continued to drop, which has further reduced the relevance of the technology. Which is not to write multi-GPU's obituary here and now, only that it's increasingly clear that mGPU is a niche setup and AMD is going to treat it as such. In any case, in line with AMD's earlier sentiment, Vega's multi-GPU support is only launching with support for up to 2-way configurations, foregoing support for 3+ card configurations. However more interestingly – and perhaps more telling – there is no mention of CrossFire terminology in the press release or driver notes. Rather, the technology is always refered to as "multi-GPU". 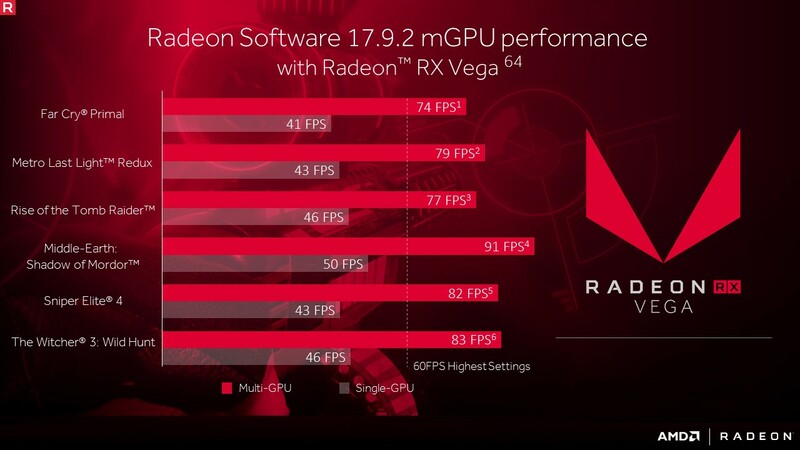 While the exact mGPU limitations of Vega weren’t detailed, AMD appears to specify that only dual RX Vega56 or dual RX Vega64 configurations are officially supported, where in the past different configurations of the same GPU were officially compatible in CrossFire. Like all GCN2 and newer cards, RX Vega mGPU is bridgeless and presumably uses the same XDMA technology as introduced in the R9 290X. In selected games, AMD cited performance scaling of over 80%. The updated drivers for AMD’s desktop, mobile, and integrated GPUs are available through the Radeon Settings tab or online at the AMD driver download page. More information on this update and further issues can be found in the Radeon Software Crimson ReLive Edition 17.9.2 release notes.